Some state parks encourage campers to decorate their sites like this one under the pines of Daingerfield State Park. On a bluff overlooking La Grange, ice skaters swirl on an imaginary pond and penguins check their fishing lines amid a sea of twinkling lights. They’re part of the quarter-mile long Trail of Lights at Monument Hill and Kreische Brewery State Historic Site, which leads visitors past a quiet nativity scene, around a smokehouse trimmed in a constellation of tiny white lights, and to the doorstep of a thick-walled masonry home where Heinrich L. Kreische once lived and brewed his “Bluff Beer.” Inside, wreaths and glowing candles adorn the wood-floored home, musicians perform, and kids line up to meet Santa and Mrs. Claus. When the bustle of an urban holiday feels too slick, a trip to a state park can put a more laid-back—and Texas-style—spin on the season. 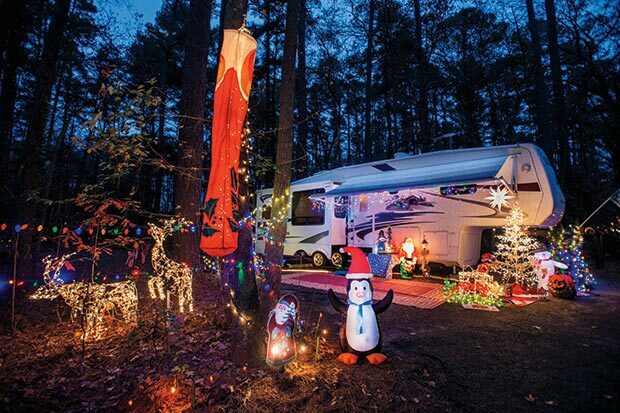 Some parks encourage campers to deck out their RVs and tents with strands of glowing lights and decorations. Other parks host events that remind visitors what it was like to celebrate Christmas more than a century ago. And in Texas, that can mean Longhorns, airboats, hay rides, and campfires. According to local lore, a sailor returning to the ship on Christmas Day met a young boy begging for money and food. Touched, he brought the boy back to the ship with him to share a turkey dinner with the crew. His fellow sailors headed out to invite other kids to join them. That sparked a tradition that continued through World War II. Today, the vessel’s Yuletide Texas celebration brings back those days, complete with live music, Santa Claus, and a station where visitors can write messages that an assistant will send in Morse code to the North Pole. Battleship TEXAS’ Yuletide Texas is 11 a.m.-3 p.m. Dec. 9. Free with ship admission: $3 ages 5-11, $12 ages 12-65, $6 for seniors, free for active and retired military. Call 281-479-2431. Palo Pinto County’s lush grasses have long attracted ranchers, including Charles Goodnight and Oliver Loving, namesakes of the famous cattle trail, who lived just 10 miles from the park in the 1850s and ’60s. To honor the lifestyle of the cowboys who herded those cattle to railyards, the park hosts the Cross Timbers Cowboy Christmas celebration every December. Gather around a campfire in the park’s outdoor amphitheater for holiday carols, stories, poetry, and a taste of the life of a working cowhand. Lake Mineral Wells State Park’s Cross Timbers Cowboy Christmas is 6 p.m. Dec. 9. Park entry is $7. Call 940-328-1171. Santa and Mrs. Claus skim down a canal, arriving at the park’s boat dock by buzzing airboat in this salt-spray-infused holiday celebration, dubbed A Very Marshy Christmas. From there, the Clauses head to the park’s cabin, where kids line up to chat, make their own holiday ornaments, and ease the chill with a cup of hot chocolate and cookies. Sea Rim State Park’s A Very Marshy Christmas is 3 p.m. Dec. 23. Free admission; the park will collect donated toys for children displaced by Hurricane Harvey. Call 409-971-2559. Forget Santa and his reindeer-drawn sleigh. At Hollydays in the Park, visitors can climb aboard a wagon for a close-up look at the resident herds of Longhorn and bison. Afterward, they can paint livestock-themed ornaments, sip hot chocolate, and listen to holiday stories while they warm their toes alongside a crackling campfire. San Angelo State Park’s Hollydays in the Park is 6-8 p.m. Dec. 16. No entry fee. Call 325-949-4757. Move from one 1850s-era scene to the next at Barrington Living History Farm’s Candlelight Christmas, a walking tour that begins at the home of Dr. Anson Jones, the last president of the Texas Republic. You’ll visit a room where a traveling preacher shares a short sermon written more than 150 years ago, and then visit the slave quarters to learn how they marked the holidays. The experience ends with a barn dance, where guests can learn to dance the Virginia reel, listen to holiday readings, or visit with an old-fashioned Santa. 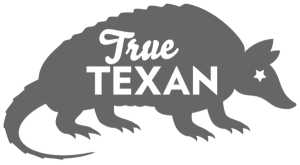 Washington on the Brazos State Historic Site’s Christmas on the Brazos is 5:30-8 p.m. Dec. 9. Admission is $5 for adults and $3 students. Call 936-878-2214 ext. 246. Hitch a ride on a stagecoach at the Grimes County Courthouse and travel back in time as you roll to Fanthorp Inn, which catered to travelers during the late 1850s. At the annual Twilight Firelight, you’ll hear fiddle music, sample wassail (hot mulled cider), and get a lantern-lit glimpse of the old cedar log structure built by English immigrant Henry Fanthorp, the town postmaster. Stick around for stories, dancing, and poetry. Fanthorp Inn State Historic Site’s Twilight Firelight is 4:30-7 p.m. Nov. 25. Suggested donation of $10 for adults and $5 students. Call 936-873-2633. Hundreds of luminarias cast a glow on Joseph and Mary (who rides a real donkey), as they search for a place to sleep in Fort Leaton’s La Posada del Fortin. The traditional posada takes place around Big Bend Ranch State Park’s visitor center, which is housed in an adobe building that served as a trading post in the 1800s. Afterward, mariachis perform, folklórico dancers twirl their skirts, kids take swings at a piñata, and everyone sings holiday carols. Fort Leaton State Historic Site’s La Posada del Fortin is 5-9 p.m. Dec. 20. No entry fee. Call 432-229-3613. President and Mrs. Johnson started the tradition of the annual tree lighting here 48 years ago, harvesting and decorating a native cedar tree placed in the visitor center courtyard. 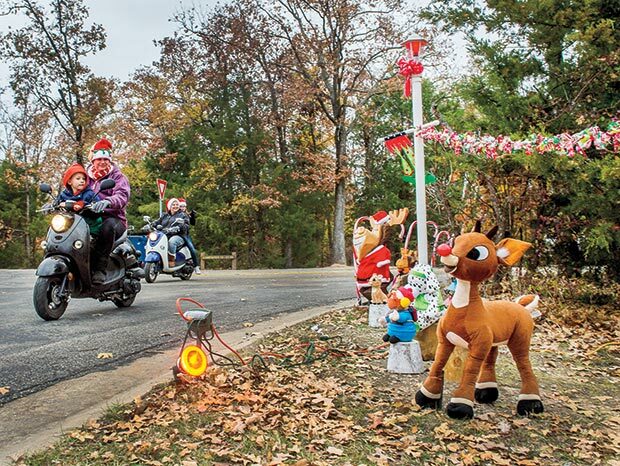 Members of the Johnson family still attend the event (as does Santa Claus), and the tradition has become a cornerstone of the holiday season for residents of the Hill Country. After the lighting, visitors walk the trail to the park’s Sauer-Beckmann Living History Farm, where the lamp-lit farmhouse is decorated as it would have been in about 1900. Living historians also serve cookies made in the farm kitchen. Lyndon B. Johnson State Park and Historic Site’s LBJ Tree Lighting is 6-9 p.m. Dec. 17. No entry fee. Call 830-644-2252. Lake Tawakoni State Park celebrating christmas in the park. Campers decorate their camps sites for christmas. Numerous Texas state parks are hosting holiday events in December. Search the Texas Parks and Wildlife Department calendar for more info.